February 2010 – 5th tranche of UFO files. Watch the YouTube videocast here. The National Archives have released the fifth collection of UFO files from the Ministry of Defence. The files can be downloaded free of charge for one month from the TNA UFO website which also contains a 10-minute audio/visual summary of the contents and a guide to the highlights. As TNA’s consultant for the project I have been helping to prepare for what is the largest release of files to date. There are 24 files in this tranche containing more than 6,000 pages of documents spanning 1994-2000. The correspondence files span the period 1994-99 and the UFO report files begin in August 1996 and end in September 2000. 1996 was one of the busiest years for UFO reporting, with 609 incidents logged by the MoD. The popularity of the subject, encouraged by TV, films and media hype, continued into 1997 when 425 reports were received. But from that point there was a steady decline in reporting, with 193 incidents in 1998, 228 in 1999 and 210 in 2000. It is important to note that most of these reports should not be regarded as “UFOs”, as few if any were investigated or followed up to the stage at which it was possible to eliminate even the most basic explanations. An Air Ministry study in 1955 found that 90% of sightings they received at that time could be explained if inquiries were made before the scent went cold. In the 1950s sightings were investigated by air intelligence officers, who found many could be accounted for as balloons, aircraft, fireballs and celestial objects. By 1996 when these MoD files were compiled, few of the incidents were investigated thoroughly and even the most interesting were simply filed away. This was due to lack of time and resources, as desk officers were distracted dealing with correspondence with UFOlogists and members of the public who believed they were hiding facts about alien visitors. This does not mean the files contain nothing of interest. This tranche contains a fascinating example of a “Close Encounter of the Second Kind”, the account of a man who suffered an unexplained illness after he was struck by a beam of light from the sky. The identity of the witness – who worked in a funeral parlour at Newport, Gwent – has been redacted from the file. But a two-page report on the case completed by an officer at a RAF base in Wales the morning after the encounter, on 27 January 1997, describes the incident in bare detail. Whilst driving near Ebbw Vale at 10.40 the witness saw “a massive star” approaching his car from the east. Then a “tube of light” came down from the sky at a 45 degree angle, surrounding him. He stopped and switched his headlights off as “the light encircled the car, remaining for perhaps five minutes.” During this time he got out of the car and walked through the brilliant light. He noticed there was no sound as would have been expected if the light was a searchlight from a helicopter or aircraft. Very frightened, he began to feel ill and vomited later that night. As he returned to the car he noticed it was covered in dirt or dust and found his radio and mobile phone would not work. When he called the RAF the following morning he was still feeling ill and had developed a skin condition that needed medical treatment. But that is all the brief report tells us. There is no evidence in the file to suggest the MoD followed up this startling incident or collected evidence from the scene (DEFE 24/1988). DEFE 24/1977 – contains papers on the Boston Stump radar incident (see my 2006 Fortean Times article for full background). Unusual phenomena seen on radar are oft-cited by UFOlogists as examples of hard evidence for the existence of “structured craft of unknown origin.” The key radar case in these papers occurred during a UFO flap over East Anglia on 5 October 1996. Police reported seeing flashing coloured lights over The Wash and alerted the coastguard, who contacted the RAF. This call led radar operators to link the UFO scare with an unidentified “blip” they could see hovering above Boston in Lincolnshire. But as this “UFO” did not move for nine hours – until dawn broke – cool observation confirmed it was a “permanent echo” caused by the 273ft (83m) spire of St Botolph’s Church, known locally as Boston Stump. 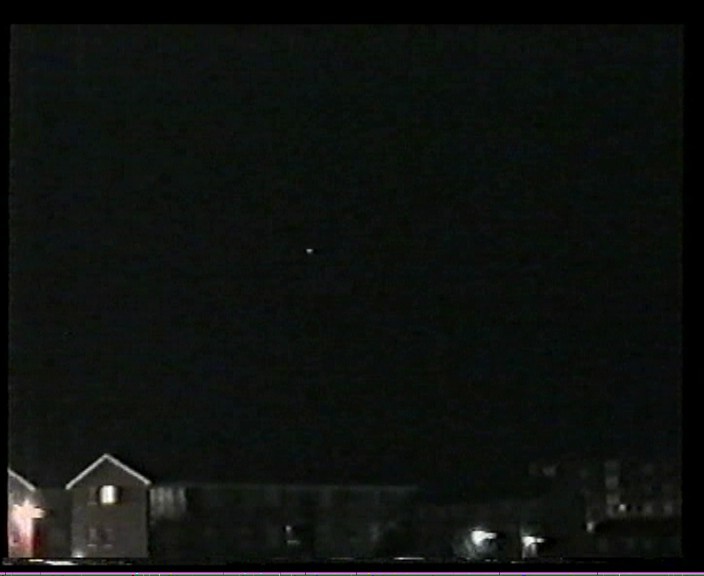 The lights seen and captured on video by the police (still taken from police video – above right) were easily explained as bright stars which faded in the dawn sky. This illustrates how easy it is, even for experienced operators, to misinterpret natural phenomena seen on radar as something extraordinary, particularly when a UFO flap is underway. DEFE 24/2008 – UFO on radar, Prestwick Airport, Glasgow. Air traffic controllers at Prestwick in Scotland tracked a huge UFO on the morning of 15 February 1999. The blip appeared to be ten miles wide and two miles long and travelled at a speed estimated at 1000 knots across the Irish Sea. This report triggered an investigation by RAF Air Defence experts. They examined the video tape from Prestwick control tower and compared its contents with recordings from RAF air defence radars. This revealed there were no aircraft in the area at the time and nothing unusual was detected by RAF radars. The conclusion was: “recorded radar data replays do not support the sighting”. UFO crash at US listening post? DEFE 24/2011 – The ‘Rendlesham Forest’ UFOs reported by USAF security policemen at RAF Woodbridge, Suffolk had become a cause celebre by 1999. In this year Scottish UFOlogist James Easton published copies of the original witness statements made by the USAF security police in January 1981 that he had obtained from an American UFO group. Copies of these statements were sent to the MoD and placed on a departmental file. DEFE 24/1966 – contains a letter to the MoD from Ralph Noyes (pictured right), a retired senior MoD official who had responsibility for UFO incidents. In his 1994 letter Noyes describes seeing gun camera film of unidentified aerial phenomena captured by RAF fighter pilots during the 1950s. He claims this was shown at a secret sub ground film-show arranged for Air Defence staff at the MoD Main Building in 1970 when Noyes was head of DS8 (one of the branches responsible for UFOs). Noyes’ letter says a representative from the Meteorological Office was also present. Some UFOlogists are obsessive letter-writers and this release contains a number of files dealing with “persistent correspondents” who have plagued the MoD and politicians with demands for information about UFOs. DEFE 24/2016, for instance, runs to 318 pages of correspondence between a Welsh UFOlogist, Dr Colin Ridyard, and the MoD. His campaign began in 1996 and ended in 2000 when Ridyard made an official complaint to the Parliamentary Ombudsman after his requests for disclosure of UFO documents were refused. During these four years Ridyard wrote 35 letters to the MoD, encouraged his MP to submit three Parliamentary Enquiries and organised a petition that was submitted to the House of Commons. Other files feature a series of letters from UFO believers addressed first to the Tory Prime Minister John Major and then, from 1997, the newly-elected Tony Blair. These ask for the Prime Minister’s views on UFOs and alien life and appeal for the release of secret documents they believe the MoD are with-holding. On this evidence, David Cameron should expect a full postbag from UFO believers when he enters Downing Street in May! (for examples see DEFE 24/1967, DEFE 24/1968, DEFE 24/2011, DEFE 24/1969). DEFE 24/1994 – contains details of one of the most hyped, and least substantial, UFO stories of 1997. This concerns a supposed UFO sighting in the vicinity of the Kent home of the former Tory Home Secretary, Michael Howard. The basis of the story was that a journalist and others had seen a triangular shaped object hovering near Howard’s home one night in March. The connection with Howard was tenuous, to say the least, and inquiries by the RAF found there was no unusual air activity or any security alert in the area at the time. DEFE 24/2017 – Councillor Billy Buchanan, of Falkirk District Council, wrote to PM John Major in 1994 asking for an inquiry into a series of unexplained UFO sightings around Bonnybridge, a small town between Glasgow and Edinburgh. Press reports had described this region as “the Bonnybridge Triangle”. In his letter Cllr Buchanan claimed more than 600 separate incidents had been reported over a two year period. In response MoD said there was no need for them to investigate anything as they had received only a handful of reports from the Falkirk area. They felt most could be explained by aircraft overflying the area. In 1997 Cllr Buchanan wrote to Tony Blair again requesting an investigation but received a standard response from the MoD.